Rodriguez's 33 points came on 12-21 from the field, 4-9 from behind the arc, and he also had eight rebounds and two assists. Angel Delgado also had a big afternoon, as he notched 16 points (6-12 FG) and 19 rebounds to give him his 18th double-double of the season and 68th of his career. He actually notched the double-double in the first half when he had 10 points and 11 rebounds. Myles Powell had 12 points (3-13 FG, 2-8 three-pointers), four assists, and four rebounds. Khadeen Carrington had 11 points (4-14 FG, 1-6 threes), five assists, and three rebounds. DePaul was led by Marin Maric, who had 23 points on a superb 10-12 from the field, including 2-3 on threes, with eight rebounds and two assists. Max Strus had 14 points (5-13 FG, 1-5 threes), eight rebounds, and four assists. The game started out pretty evenly, with Seton Hall and DePaul trading baskets for the first 12 minutes. 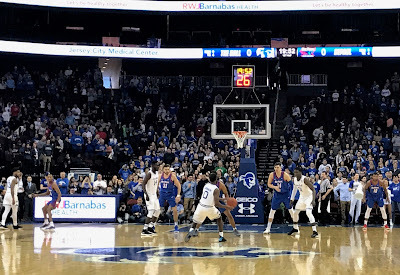 A Carrington jumper at the 7:50 mark tied the game at 23, and that started a 17-3 run capped by a pair of Powell free throws to make it 38-26 Seton Hall with 3:16 left in the first half. DePaul responded with a 10-0 run to close out the first half and pull to within 38-36 at the half. Myles Cale had six points off the bench for Seton Hall in the first half. 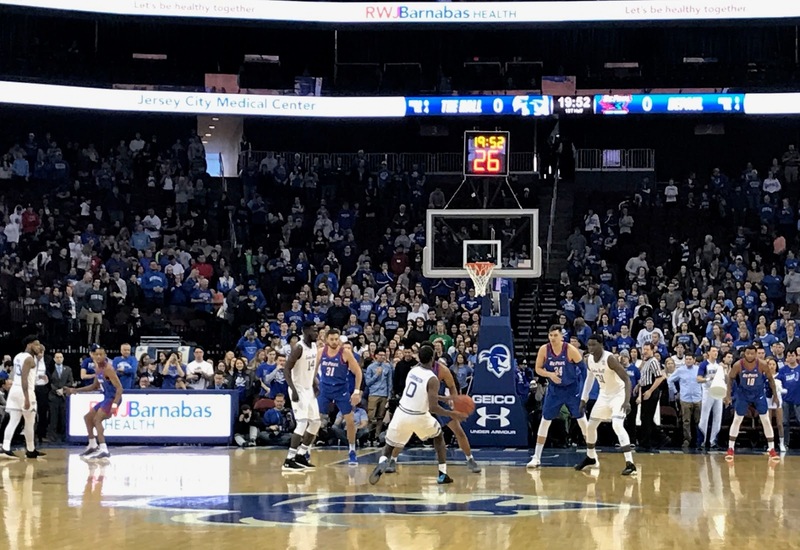 Maric opened the second half with a layup to tie it at 38, and Seton Hall responded with six straight points, as Delgado, Rodriguez, and Carrington each made layups to make it 44-38 Seton Hall at the 18:02 mark. The Pirates kept it going, as they went up eight, 52-44, on a Powell three-pointer at 13:48. They made it nine on a pair of Delgado free throws with 8:55 left. DePaul would not go away, as a Maric layup cut it to three, 66-63, with just 4:46 left. Seton Hall came right back, as a Rodriguez three made it 75-66 with 2:08 remaining. DePaul responded with an 8-2 run capped by a Justin Roberts free throw to make it 77-74 Pirates with 39 seconds left. DePaul fouled Rodriguez and he drained both free throws, and Strus followed with a three to cut it to just two, 79-77 at the 28-second mark. On the inbounds, DePaul fouled the right guy, as they sent Jordan Walker to the line. He had just two points up to that point, and he made one of two to make it 80-77 Seton Hall with 25 seconds left. DePaul took a while to set up their play, and it was Eli Cain who went down the lane for a layup, and missed. Cain then fouled Rodriguez, which sent him to the line with nine seconds left. Desi drained both of his free throws to make it 82-77 and seal the win. "I mean, he's been our best offensive player over the last five games, by far, and most consistent. I thought he got off to a good start, I thought he passed the ball phenomenally -- I think he started 0-for-4 or 1-for-5, or something like that -- but he was passing the ball great. He got Myles (Powell) two open shots, got a guy a layup, and so the way he was passing, I loved the way he kind of got everyone involved early, and with Des, it's only a matter of time until he gets it going." "Again, when he's locked in defensively, he's just such a different basketball player, and he really was locked in on (Max) Strus. I thought he did a phenomenal job in the first half of really making it hard for him to get off and kind of get going, and then I thought he rebounded the ball the best he's rebounded all year." "It was a huge win, 7-7. Each one this time of year -- any win this time of year is a big one, and this was a big one. I was extremely happy, yes. Considering the fact that we've been on the road and we've been traveling, for the guys to give the effort that they did Friday and Saturday after the Xavier game -- we've been practicing great -- it was good to get home. We had a good shot in the first half -- I think we were up 12 in the first half -- and they had a much better final four-minute stretch than we did. But I thought we did things to win the game today instead of losing it." "I stopped practicing the big fella just because I really want to take care of that knee. It's fine, he feels good -- he doesn't even have to get therapy on it -- but it's one of those things in practice where I'm just worried about him bumping knees with somebody and then all of a sudden, it flares back up. I thought after really struggling on Wednesday, I thought he came out and really bounced back great." "It's -- one of our weaknesses had been getting beat off the dribble -- and I thought we made a good adjustment at Xavier. (Trevon) Bluiett just killed us. And I thought tonight, when we started getting beat off the dribble again early in the first half, the guys did a much better job understanding and trying to keep guys in front of us, make them take tough twos. We wanted to chase them off the three-point line early, and I thought we did a good job of that in the first half." "I have a really bad wheel right now. My right knee is swollen like a cantaloupe, it just -- I have to exercise this year or I'll probably have a heart attack, and I won't stop -- I have to get surgery at the end of the year on it, and so -- I just -- right now, I could feel it throbbing. I was on a treadmill last July, and it stopped and started, and I tore some of my meniscus. I wasn't going to ruin my August golf season -- I was stubborn -- I thought it would go away, and it hasn't gone away, and now I'm stubborn because I need to work out this time of year to relieve stress, and it's getting worse. Once the season's over, the doctor is going to scope me and take care of it." "I actually -- I never get to sit and talk to our guys when they come out of the game -- it's actually nice. You can have a conversation with them and it's not in the huddle, it's not -- Sha (associate head coach Shaheen Holloway) does a great job, so I'm not worried about that aspect -- but it's nice to sit down and talk to your guys in a different way while the game's going on, and I get a chance to be the guy that pumps them up a little bit. Unfortunately, it's just a bad wheel." "Our last four before this were really tough, too. I think we have shown in spurts, on the road -- the second half at Xavier, the second half at Georgetown -- I thought our first half tonight was really good. We've just got to put it all together. We've been struggling, and what I mean is, we've been doing things -- against Marquette, we missed a ton of free throws that just took -- every time we had momentum, we missed two free throws or missed a one-and-one that just took all our momentum away from us. At Georgetown, we missed four free throws in the last three minutes, it took all the momentum from us and we still had a chance. Xavier just played really good. I mean, friggin' Trevon Bluiett, when he plays like that, good luck." "We're not falling apart. That seems to be -- I've seen a lot of teams lose -- I go through college basketball and I see a lot of teams who have lost three out of four. It's called league play. We've lost at Villanova, we lost at Xavier, we lost at Georgetown. It's not my fault we don't have home games this time of year. We've just been on the road. You're not going to -- no one's like, perfect on the road. You've got to battle, and I love the way our guys have battled. I love our attitude. We came back after losing four in a row, we had two great days of practice, and we came out -- I thought we played pretty good today. You're not blowing anybody out on the road this time of year. It's just not happening. I mean, DePaul blew out Providence, but..."
"It's something that we've been -- it's something that he's been missing from his game a little bit is his enthusiasm and his energy. I think when you're hurt, that's one of the things that goes right away because you start thinking about -- you start thinking a whole lot more than just playing. I think the fact that he feels really good right now and his knee feels good, he got back to just playing basketball and playing the way he always plays. But the last two or three games -- he hurt himself in the first half of Marquette -- you start thinking about that a little bit, and when you think -- and Angel's not a thinker of a player, he's more energy, he's more emotion -- you see what you got tonight, and I think that's what you'll see going forward." "He is our emotional leader, by far. It's not even close. He always has been, he's been since day one. Since he stepped on campus, he's been the guy that these guys feed off." "Myles Cale played really well in the first half, and then Desi just had it going. I wanted to slide him in there for Myles Powell, but I was hoping Myles Powell would make a shot for us and kind of get -- but Myles was passing the ball tremendous. He draws so much attention. Again, I think the freshmen have been really progressing great." "We wanted -- considering the fact that Jordan (Walker) missed two free throws -- he's a freshman -- they weren't going to let Myles Powell get it. Desi's our best ball handler in that situation, so yeah, we were trying to get the ball to Desi." "You've watched Desi now for four years. He has his Desi moments. He's 90 percent good, and I think the problem with everyone when he does have his -- what I call his moments -- is when he's playing and he's locked in, I think he's the most dominant player in the league, and there's times where he goes through a little two-minute stretch where he doesn't have it. I'm used to it, the team's used to it, and we know how to do it." "He's a senior. I liked the way he was playing. I thought he was playing really well, and I thought he was playing extremely hard. Sometimes you've got to trust your kids, and I have great trust in Desi, and I know he's going to snap back out of it. He did within two seconds -- two minutes. Sometimes when he gets like that and you take him out, he doesn't snap out of it. You've got to let him play, and Desi, I let play."